ROSEMEAD, CA (smt)- After winning their first three games by a combined total of four points, #11S-Loyola-Chicago made sure to secure their Final Four berth routing #9S-Kansas St, 78-62. In pushing the pace, the Ramblers had 15 turnovers and K-State converted on a lot of them, but Loyola-Chicago helped themselves by shooting 57.4% from the field and 50% behind the stripe (9/18) while the Wildcats shot 34.8% from the field. Sister Jean and the Missouri Valley Conference tournament winners will go to San Antonio as the fourth #11 seed to make it. #3W-Michigan was only pretty in short bursts but it was enough to hold off #9W-Florida St, 88-84. The Wolverines went on a 11-1 run in 4:52 early in the second half to turn a one-point deficit into a 10-point lead and then a 7-0 run in 1:49 to build back a 10-point lead with 2:26 left. But the rest of the time Michigan was sloppy (same for Florida St) and the Seminoles took advantage late to quickly score 8 of the next 9 points in 1:09 but could not get closer than 2 in the final seconds. However, in the most bizarre sequence, down by 2 with 24 seconds left, the Seminoles prevented Michigan’s poorest free throw shooter Zavier Simpson from getting the in-bound pass and allowed near 90% free throw shooter Duncan Robinson to get the ball instead and was fouled. 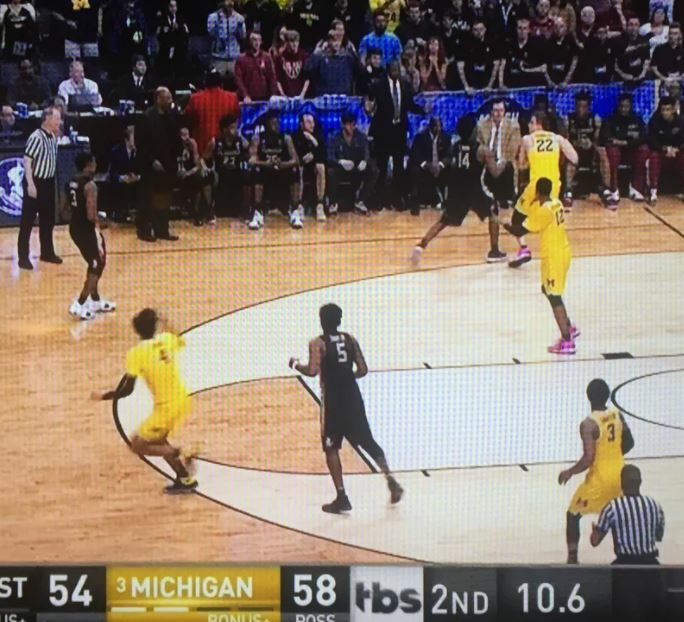 Simpson had already missed the front end of a 1-on-1 and missed 1 of 2 the last trip (why Michigan kept giving him the ball was a gift that kept on giving to FSU) and, so of course, Robinson easily nailed both free throws to put Michigan up 58-54. After a missed 3-point attempt, Michigan got the rebound but the Seminoles did NOT foul, essentially giving up with 10.6 seconds left. Maybe because it was Robinson who got the rebound and Florida St had no timeouts, the Seminoles felt they’d automatically be down by 6 with a foul but still, anything can happen. At least try to steal the ball. The second half was mostly ugly with FSU going without a FG for 5:44 early in the half then without a FG for 7:53 (staying in the game with 8 free throws) from 10 minutes to 2:07. Michigan went 5 minutes without a FG midway through and none in the last 2:26. Both teams shot under 39% from the field (Michigan 38.8%, FSU 31.4%) and under 24% from long range (FSU 23.5%, Michigan 18.2% (4 of 22 after making 14 of 24 their last game)). In the last 1:38, Michigan missed twice on the front end of a 1-on-1 and made just 2 of 4 in their other free throw attempts (before Robinson coolly nailed 2 with 21 seconds left). In the pool, Larzby was one of 33 to pick Michigan and moved into first place, topping the century mark (101 pts). Philly Eagles Again moved into 2nd (97) and Billiam and Lady Chocoholic moved into a tie for third with M Star (96). Former leader SacKings4Ever fell to 6th (95). BallerDollarCashMoney (66th-T, 79) was the only one to pick Loyola-Chicago and has this and her UMBC upset pick to be proud of. iWillLose was one of 122 to go 0-2 and remains in last with 48 points but can get out of the cellar if Villanova makes the Final. Seven can still win the pool, led by Larzby (40.6%) and Bob G’s two picks, Philly Eagles Again and Bob’s Best Bets (8th, 92), each with a 25.0% chance for 1st. 31 still have a chance to finish in the top 6 with Larzby (81.3%) and Philly Eagles Again(68.8%) leading the way. Blake H’s three entries are all still alive (Bwakewey 1 (24th-Tied, 86), Bwakewey 2 (21st-T, 87), and Bwakewey 3 (24th-T)). If you want to know which of the 32 scenarios you will win money, email or tweet @HWCI_Pools your request. We are now on Twitter (@HWCI_Pools). Please follow! I will post using #hwcincaa mini-updates during the day so you can follow without being on Twitter (and if you are, please use #hwcincaa). Please join our Facebook HWCI NCAA Pool Groupor post comments on our blog. Here you can join the group and meet your competitors, make new friends, set up NCAA watching gatherings, and post stuff to the wall (pictures, witty comments, etc.). The following takes place between 9 am Saturday and 9 am Sunday. Events occur in real time.